FROM MY PORTFOLIO, ARTIST JOHN FROEHLICH. MY ARTWORK HAS BEEN COLLECTED INTERNATIONALLY AND SHOWN IN GALLERIES WORLDWIDE! READY TO FRAME ACRYLIC PAINTING. PAINTING MEASURES 22X30 EXECUTED ON HEAVY ARCHIVAL PAPER. INTERNATIONAL BUYERS, PLEASE UNDERSTAND THIS.... POST OFFICE OR A FOREIGN POST OFFICE. PLEASE DO NOT B'D ON ART, IF YOU CAN'T FOLLOW THRU WITH AGREEMENT. CUSTOM ORIGINAL PORTRAITS, OF ANY FAMOUS MUSICIAN, OR YOUR FAMOUS SELF ARE. PRICE LIST AVAILABLE UPON REQUEST! ATTN: MUSICIANS, WRITERS & FILM MAKERS..... BOOK, DVD & CD COVER ART COMMISSIONS. I HAVE OVER 900 PAINTINGS IN MY PORTFOLIO! THIS PAINTING MUST BE SEEN IN PERSON... YOU WILL BE AMAZED AT THE. VIBRANCY OF THE COLORS, WHICH DO NOT PROPERLY TRANSMIT ON A. THIS ORIGINAL PAINTING WILL BECOME A CONVERSATION PIECE IN YOUR HOME. AND REMEMBER ART ALWAYS MAKES A GREAT GIFT! Hello, my name is John Froehlich, a professional FULL- TIME artist. Been shown & collected internationally. A Jersey shore resident now, I was born and raised in Manhattan, where for many. Years, I had seen and drawn many of the Jazz & Blues greats, up close & personal. At such venues as the Village Vanguard, the Blue Note and Birdland. At an early age, it was my grandfather who influenced my life-long love of jazz. Standards, blues and boogie woogie. He played guitar for the Dorsey Brothers, the. Paul Whiteman Orchestra, and on Broadway. Grandpa was instrumental in fueling the. PLEASE CHECK OUT MY FULL BIO.... FRO-ART JAZZ, BLUES AND ROCK PAINTINGS! 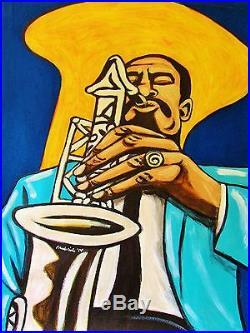 With over 1,100 JAZZ, BLUES & ROCK PAINTINGS in my portfolio, I have produced. Art work for CDs, music publications, posters & t-shirts. Been gladly accepted, for restaurants, homes and offices, worldwide. DELMARK 60 Years of Jazz/ 60 Years of Blues. MISSISSIPPI SAXOPHONE The Great Blues Harmonica Players. CHUCK BERRY: Confessin' The Blues. JUNIOR WELLS: Paint The Town Blues. Gene Ludwig "Love Notes of Cole Porter". The Commons "American Ghost" CD (Trenton, NJ). The Brown Street Jazz Band "Live at Evergreen" CD Harper's Ferry, W. And Tommy Mac's "Do Ya Wanna Dance" CD (Toronto). The most recent music festivals that have commissioned my artwork are. The 2014 Mayor's Blues Ball, Medicine Park, Ok. The 2008 Melbourne Australia Jazz festival. The 2007 Red Bank (NJ) Jazz and Blues Festival. The 2006 Grafton Blues Festival, Wisconsin. And The 2005 Hot Summer Jazz Festival, Minneapolis. I HOPE YOU ENJOY MY ART, AS MUCH AS I ENJOY CREATING IT! I TAKE EVERY HIT ON MY LISTING AS A COMPLIMENT, SO.. THANKS AND GOOD LUCK B'DDING! The item "ERIC DOLPHY PAINTING jazz alto sax saxophone flute five spot cd town hall mingus" is in sale since Tuesday, July 16, 2013. This item is in the category "Art\Paintings". The seller is "fro-art" and is located in Long Branch, New Jersey. This item can be shipped worldwide.